Unlike the standard setup in which we use syringe to create and drop the liquid onto the surface, this unique instrument can be used to create two independent droplets inside a liquid bath. The droplet surface can be visualized from bottom and side-ways using a unique camera setup. In the pendant drop deposition technique, a needle containing the drop at its end is brought near the surface. On touching the surface the drop spreads and attains equilibrium and in the process the drop gets detached from the needle spontaneously. This mechanism inevitably requires the condition that the drop-substrate surface energy is larger than the drop needle surface energy. Hence for surfaces, for which the corresponding drop-substrate surface energy is much smaller than the drop-needle surface energy, such simple steps, as discussed above, do not occur. Using our instrument, one can generate a drop at the tip of a needle inserted inside the liquid bath, where the low energy substrate is present. 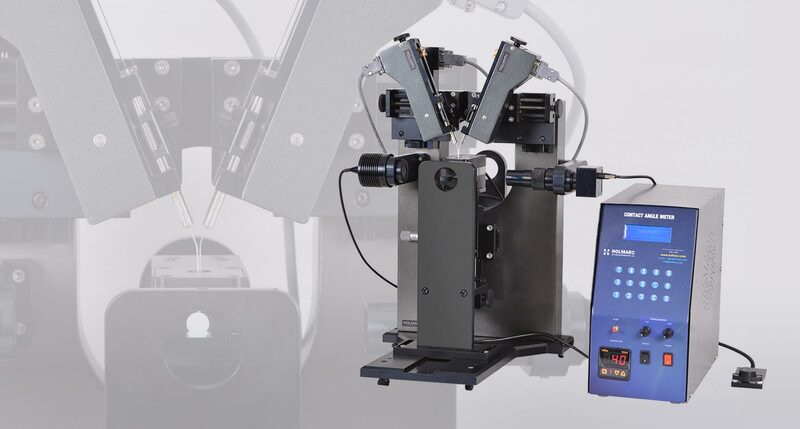 Instead of bringing the drop closer to the substrate as we do our standard contact angle meter, we take it away from the substrate so that the drop needle entity hits the liquid–fluid interface. Here this fluid can be air, or some other liquid whose film has been deliberately created on the liquid surface. The moment the drop-needle combination hits the liquid–fluid interface, the drop and the needle are subjected to different surface tension forces, thereby allowing them to get detached from each other. Consequently, the needle goes out of the liquid bath, whereas the drop remains at the interface. The motions are fully automated and can be controlled using dedicated software. 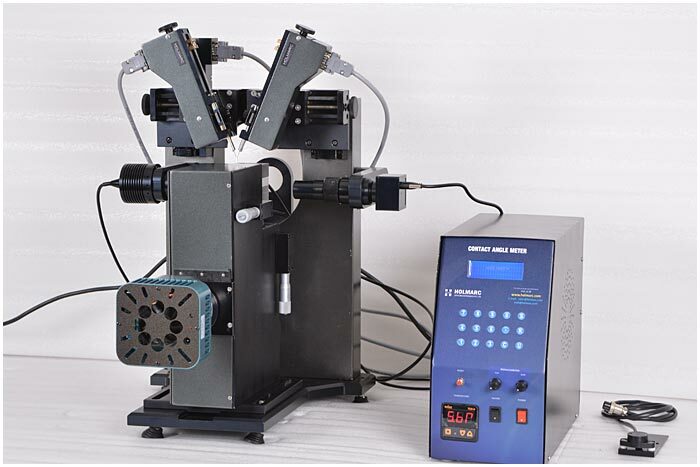 The system includes dual Syringe pump, two 13.5mm W.D 10 X objectives, zoom lens assembly, Image combining optics, 5mp USB camera, sample positioning stage, LED light source etc. The bottom & side profile views of the droplet are same in width and can be viewed in a single window. There are two backlight LED’s provided along with the equipment., the top light LED and side light LED. They are integrated on the same unit which is detachable whenever required. 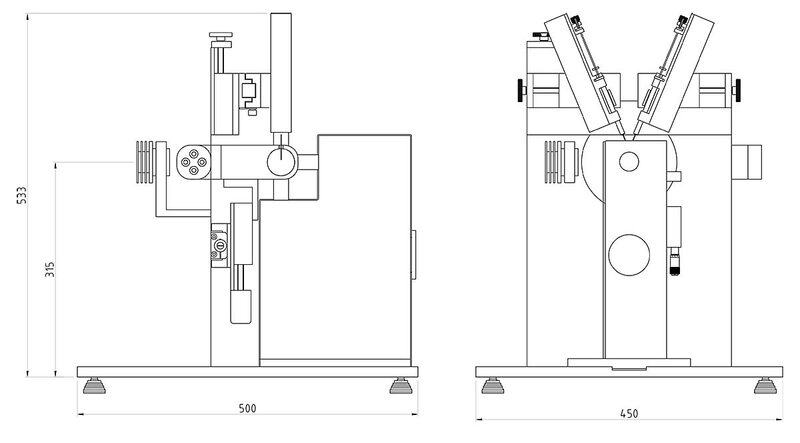 The automatic retraction of syringe head (two syringes will move together) is possible in the equipment. The automated retraction speed max is 4mm / sec. 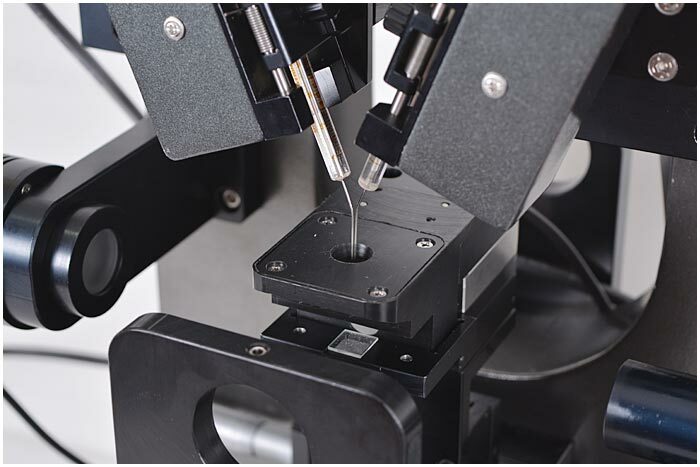 The camera can be positioned at different angles to the needle assembly to get a view on entire drop/drops sitting inside the cuvette. X - Y translation for the substrate holder is provided in the equipment. Imaging area of our CMOS sensor is 1.2 x 0.85 mm for bottom and side imaging. Provision to integrate your camera in the present equipment. 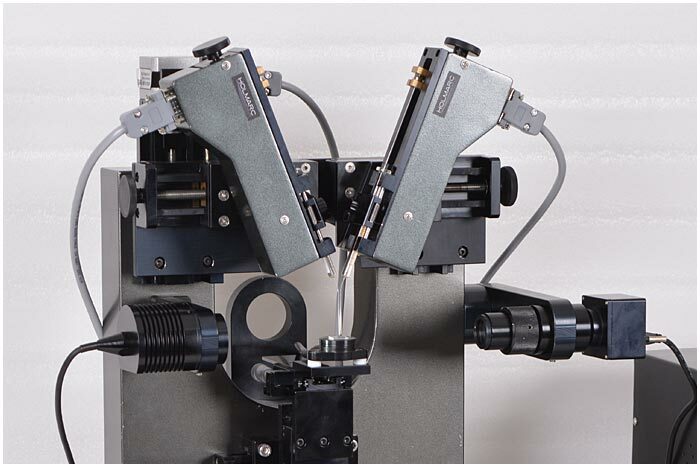 Standard contact angle measurements can also be conducted and studied using this equipment.